Propellerhead Reason 10 has launched, and according to the Swedish software company, it’s "The biggest update. Ever." 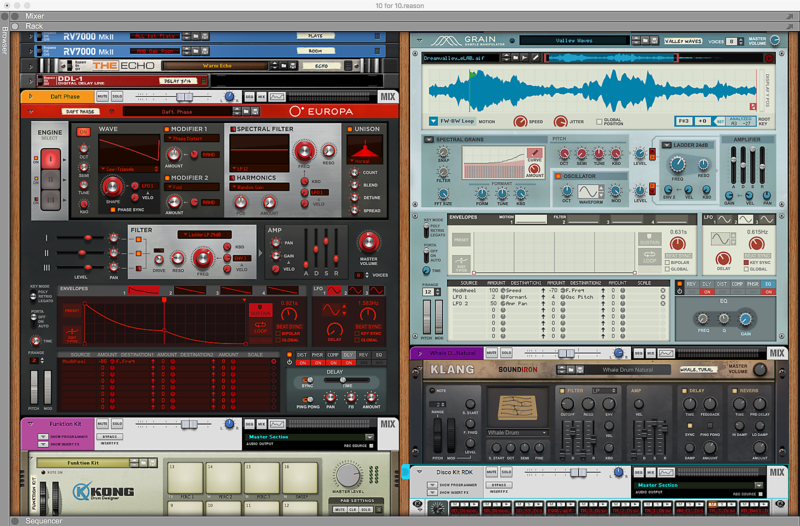 After adding long-awaited VST support in Reason 9.5, Reason 10 focuses on adding new synths and sounds to their ever-growing arsenal of virtual rack gear. We were lucky to get a sneak peak of the newest release and all of the new instruments. Here’s a quick beat we made that showcases some of the new sounds, along with a breakdown of the track elements. With the Redrum and Kong drum machines, Reason offers both step sequencing and pad performance for building beats. 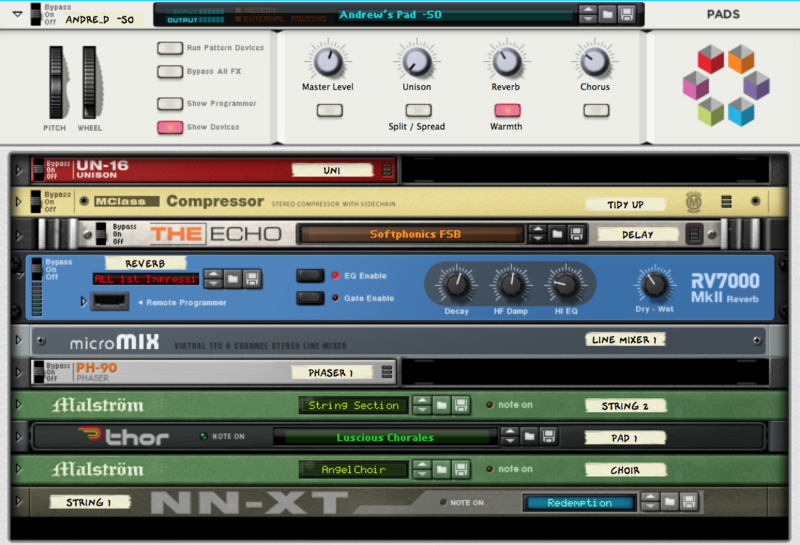 In Reason 10, the focus is on adding new production-ready drum sounds across a range of styles. We dialed up the new "Funktion" drum kit for the Kong via the new "Drum Supply" library and programmed the rhythm pattern above. We tweaked the pitch of the snare down slightly and tightened the decay for a punchier sound. Europa is a brand new instrument from Propellerhead focused on wavetable synthesis. This synth uses complex waveforms and real-time waveshaping for a huge range of classic and cutting edge tones. We dialed up a synth bass sound called "Daft Phase" that showcases the real-time waveshaping of Europa. We tweaked the filter envelope to shorten the decay and increased the resonance for a tighter bass sound. Grain is the second new synth in Reason 10 and offers an exceptionally powerful granular synthesis engine. Granular synthesis works by breaking samples down into tiny "grains" that can then be morphed and twisted in new ways. One of the coolest uses of Grain is to drag and drop your own samples into the device. It doesn’t take long to deconstruct your samples into something fresh and surprising. For this beat, we kept it simple by using the "Valley Waves" preset to create a droning texture. We tweaked the "Jitter" to add randomness to the sample playback for a bit more sonic variety. We love to use auxiliary percussion to add movement and groove to a beat. The new Klang tuned percussion instrument features a wide collection of bells, chimes, and metallic sounds. We grabbed the "Whale Drum Natural" preset and quickly shaped it into a hybrid percussion/synth sound by lowering the frequency of the built-in filter and boosting the resonance. We adding atmosphere with the included tempo-synced delay and reverb, and to keep our mix from getting cluttered, we high-pass filtered the reverb tails. Using different devices for percussion allows you to tweak the shuffle and groove of each element independently. Here, we used the stock "Disco Kit" closed hi-hats and programmed a simple step sequenced pattern. While the other instruments have a large amount of global shuffle applied, we decided to keep the hi-hats straight which creates a sense of movement and contrast. This hybrid sample/synthesis virtual piano instrument comes stocked with beautiful presets like the "Dobro Comper" which we used in this track for its great space elements. We changed the character to a more subdued setting which rolled off some high frequencies and placed the piano clearly in the upper midrange of the mix. The Analog Replicant patch in the Subtractor synth offers a classic lead sound that soars high above the clutter cutting through the rest of the mix. While not new to this release, Subtractor still has a welcome seat at the Reason 10 table. We were drawn to this new patch for its nostalgic appeal. It sounds like something out of a movie score with a gritty noir quality that earns a place within the overall soundscape. Within the NN-XT rack there's a fantastic choral pad preset called "FATFEMALECHOIR" that we used to thicken and spread the stereo spectrum. We’ve always enjoyed Propellerhead Reason for its fresh take on computer-based music. The "rack of gear" interface metaphor is approachable and inspiring, and we end up falling deep into the realm of sound design and stumbling upon "happy accidents" when working within the Reason environment. If you’re a current Reason user, the 10.0 update adds powerful new wavetable and granular synthesis options to your toolkit. We think the new synths and sounds are worthy of the upgrade price, especially if you skipped the previous 9.0 upgrade. If you are just getting into making music on your computer, Reason is an excellent value and bridge from the world of physical gear. Plug in some virtual patch cables, turn some virtual knobs, and start making sounds.